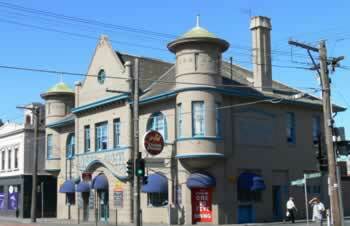 Carlton Brewery bought the hotel in 1887. They demolished and replaced the old two-storey corner building in 1911, after purchasing additional land to increase the exposure to Johnston Street. The current hotel was built in an Art Nouveau influenced style, designed by Sydney Smith and Ogg. An excellent photograph taken by Wolfgang Sievers in 1964 shows the distinctive 1911 style as it was meant to look. By the time John T Collins photographed the building in the early 1980s, paintwork had obscured the distinctive red brick and cement exterior but the overall design with two corner towers remains very striking.